The very first tires were bands of iron placed on the wooden wheels of carts and wagons. Luckily, with the discovery of rubber things changed. It was in the mid 1800’s that the first tires made using rubber appeared. They were simple tires; the rubber carried the load entirely. It was in 1845 that the pneumatic or air-filled tire - which works by air within the tire absorbing the shocks of the road – was invented and patented by RW Thomson. His design used a number of thin inflated tubes inside a leather cover (see illustrated). This meant that it would take more than one puncture before the iyre deflated. However, despite this new breakthrough in tires, the old solid rubber variety was still favoured by the public, leaving the pneumatic tire out in the wilderness. It wasn’t until 1888 that John Boyd Dunlop, unbeknownst to him, reinvented the pneumatic tyre whilst trying to improve his son’s bike. Dunlop’s tire, like Thomson’s, didn’t seem to sell at first - until a bike race in Belfast was won by a rider using his tires. With that victory, people began to take notice of the pneumatic tire. In 1895 the pneumatic tire was first used on automobiles, by Andre and Edouard Michelin. It was also around this time that legislation was put into effect that discouraged the use of solid rubber tires. All over the world companies sprang up to meet the new demand for the new tires. The age of the pneumatic tire has begun! Tires remained fundamentally unchanged throughout the 20’s and 30’s until Michelin introduced steel-belted radial tires in 1948. This new type of pneumatic tire meant that they would have a longer life thanks to ply cords that radiate from a 90 degree angle from the wheel rim. It also meant that the tire had less rolling resistance – increasing the mileage of a vehicle. One drawback was that these tires required a different suspension system on the vehicle. This new radial tire was very successful outside of the US, with companies in Italy, France, Japan and Germany producing them in large numbers. In the US however, a battle commenced. American car manufacturers were afraid that the cost to redesign their cars in order to use these radial tires was too much and so stuck to the older bias ply tires. It wasn’t until the 70’s – when there was a fuel crisis – that the American public, because of the rising cost of petrol, demanded more economical cars. This led to the introduction of cars that could easily fit the high mileage radial tires. By 1983 all new American cars came fitted with radial tires. The tires on your vehicle are the only part of your vehicle in contact with the road. Therefore, they play a key role in vehicle safety. Between the years 2007 – 2012, An Garda Síochána reported tire defects as a factor in 172 collisions. Some of these collisions were fatal, others resulted in serious and minor injuries. Why is tire safety so important? Your safety, along with the safety of your passengers and other road users, could depend directly on the condition of your vehicle’s tires. 1. Winter tires have tread patterns that are specially designed to bite into snow and ice. They’re made from softer rubber than normal tires and they stay more flexible in cold weather. This means the tire can grip the road better in snow or icy conditions. Winter tires are labelled ‘MS’ or ‘M&S’ (Mud and Snow) with the alpine symbol as shown in Figure 1. 2. Summer tires are most commonly used in Ireland. This does not mean that they are for use during the summer only—it’s merely the term used to separate them from winter tires in countries where there is a practical need and sometimes a legal requirement to fit winter tires. 3. All-season tires are a cross between summer and winter tires and are designed to cope with all sorts of conditions, including dry roads and rain. They are not specially designed for any one kind of weather condition. All-season tires carry the marking MS or M&S (Mud and Snow) but without the alpine symbol. What is an ‘E-mark’ tire? 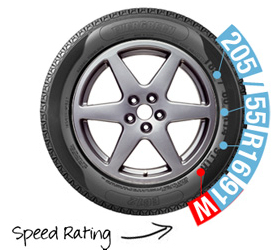 An E-mark on a tire confirms that it meets minimum EU/International (UNECE) standards in relation to its size, load and speed rating. E-mark tires have been tested to ensure they have adequate tread depth and performance ability. The E-mark consists of an ‘E’ or ‘e’ and a number within a circle or a rectangle. What is an ‘S-mark’ tire? Tires sold in the European marketplace must have an ‘S-mark’. This is a ‘sound marking’ certifying that the amount of road noise produced by the tire complies with EU standards. Since 1 October 2011, retailers cannot sell new tires unless they have an S-marking on the sidewall. normal or average noise performance. Second-hand or part-worn tires are tires which have been used on another vehicle. If you are thinking about buying a part worn tire, you must ensure the tire is safe and meets the minimum legal requirements. You should also think about whether or not you’re getting real value for money. 1. Check for an E-Mark on the tire (Figure 2). Your tires will need to carry an E-mark for the NCT. 2. Check that there is a minimum tread depth of 1.6mm on the tire. Anything less is illegal for use on a public road. A tire’s tread depth can be measured by using the handy pop-out tire tread depth gauge attached to this leaflet (Figure 5). Always measure in the middle of the tire surface, and not at the edges. 3. Tires also have a ‘tread wear indicator’ block set into them at a depth of 1.6mm. You should check this block to ensure that this indicator is not at the same level as or lower than the tire tread. 4. Ask the seller if the tire has undergone a condition check (including when it is inflated) to make sure it meets the minimum legal requirements and is free from defects both internally and externally. Common defects include tears, lumps and bulges. A tire that is not roadworthy will result in a car failing its NCT as well as reducing your safety on the road. Examples of particular tire defects are shown below. 5) Ask the seller to confirm that the tire you are buying is the correct size and design for your vehicle, and that it has the correct load and speed rating for its intended use. If you’re not sure about what tire is best suited for your vehicle, you could consult your vehicle manufacturer or look it up in the owner’s handbook. 6. Find out the age of the second hand tire and make sure that it is not more than six years old. A tire that is six years old is a ‘pass advisory’ item at the NCT. A tire’s age can be determined by the serial number on the tire sidewall. 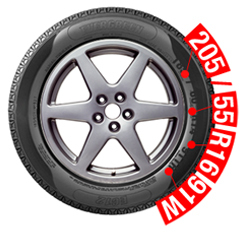 This serial number comprises of a four digit code as shown in Figure 7 and refers to the tire’s date of manufacture. The last two digits refer to the year or manufacture; the first two refer to the week in that year. For example, 1411 = week 14 of 2011. Tires deteriorate with age. Signs of tire aging include cracking or crazing (lots of fine cracks) on the side wall of the tire caused by the tire’s flexing movements. The shape of the tire tread can become distorted too. Tyre aging increases the risk of tire failure. Tires may begin to show the signs of aging from when they are six years old.Figure-7. 7. Be aware that there could be damage to the inside of the rubber which you mightn’t be able see from just looking at it, but that it would be possible to see in an x-ray. The seller might be able to show that the tire was x-rayed to prove that there is no internal damage. 8. Be satisfied that you are getting value for money. The remaining tread depth of a secondhand tyre is very important, and this is something you need to consider carefully in terms of the value for money. To check the percentage of usable tread remaining, use the pop out tyre tread depth gauge provided in this leaflet. Rotating your tires periodically can help to prevent uneven wear and prolong the lifespan of your tires. When should you rotate your tires? Generally speaking, it is recommended that you rotate the tires on your vehicle once every six months, or 6,000 miles – whichever comes first. To do so, each tires needs to be removed and refitted at a different position. This helps to ensure that each tire wears evenly and lasts longer. For each driving method, there is a correct way to rotate your tires. You want to ensure that you rotate the tires to the correct position for your vehicle. The two rear tires stay on the same side of the car and are transferred to the front. However, the front tires move backwards and switch sides. In this instance both sets of tires swap sides and position. So the two front tires move back and switch. At the same time the two rear tires move forward and switch. The above rules should not be followed if your tires are ‘directional tires’. The tread pattern on this variety tire is designed specifically to work in a certain way in relation to its position on the vehicle - switching sides would be dangerous. The tires change position, but do not switch. The two front tires move back and the two rear tires move forward – they stay on the same side of the car as before. Did you know that you are not insured when driving on illegal tires? If you are involved in an accident and it turns out that you have been driving around on tires with a tread depth lower than 1.6mm (legal limit in the UK) you could find yourself forking out a lot of money on repairs and fines. Worn ti res significantly impede the performance of your car - low tread depths reduce the effectiveness of braking, steering, and acceleration, all of which are vital in staying safe. What are a few minutes put aside now to check your tires, when you compare it to your own safety and that of your family? Check overall condition of tires, including inner and outer sidewalls. Check and examine the spare tire. Correct inflation pressure is important, as the pressurized air inside your tire has to support the weight of your vehicle and its load. Inflation pressure can also affect your vehicle’s fuel efficiency. Tyre pressures vary depending on the vehicle model and the load being carried. We recommend that you go to your local service station and check your tire pressures regularly against the manufacturer’s specifications for your vehicle. You’ll find the inflation specifications in your vehicle owner’s handbook. The following illustrations demonstrate how the effects of correct and incorrect inflation pressure can be seen on your tire tread pattern. You may hear the terms ‘wheel alignment’ and ‘wheel balancing’ used interchangeably, but they are separate issues, both important in the upkeep of your tires and vehicle. Wheel alignment consists of adjusting the angles of the wheels so that they are perpendicular to the ground and parallel to each other. Aligning your wheels can help maximize tire life and ensure that your vehicle drives straight and true when on level surfaces. pulling to one side (having to exert a slight extra force to keep the vehicle driving in a straight line). Allows the tires and wheels to spin without causing any vibrations. Your wheels’ balance is gauged by checking for any heavy spots on the wheel-tire combination and compensating for such flaws by placing a measured balancing weight on the opposite side of the wheel from where the heavy spot is located. If your tires demonstrate any of the symptoms outlined above, we advise that you seek advice from your local authorized tire repair center. Why is the diameter so important? It is because speedometers, traction control, torque and the gear settings of a car are based on how far the tire travels in a full revolution. This is linked to the outside diameter. If the size is too different this affects the time/length it takes for a full tire revolution (the tire rolling circumference), which will cause your speedometer to display incorrect readings and your gearing will be adversely affected. So, when changing the size of wheel and tire fitted to your car, it needs to be the same overall diameter as what the car was designed to work with.Unfortunately it isn’t immediately easy to work out the outside diameter when changing tire sizes as tire sizes are measured using the inside diameter. On a tire, the outside diameter is determined by the sidewall and is more commonly referred to as the aspect height. The aspect height of a tire is shown in the tire size as a percentage of the width - the aspect ratio. Let’s take the tire size 205/55/16 for example. 205 is the width of the tire in millimeters – fairly straight forward. However, the 55 is the ratio of the tire’s width to the tire’s height. So it means that the aspect ratio is 55% of the 205mm width. In this instance that is 112.75mm. At this point you will need to convert the size from millimeters to inches – there are 25.4 mm in every inch. To find out what the standing height is, you need to double the aspect height, (top and bottom of the sidewall) and then add on inside diameter – in this case 16”. So, in our example, the standing height will be 24.88 inches. Now, that you have the standing height of the old tire, you can work out which new tire size will also work on your car –as the standing height will need to be the same. When changing tire size, the tires should not have more than a 1% difference in diameter - less than 0.5% would be ideal. The speed rating of a tire is displayed on the sidewall. Like in the image, you will find it at the end of the tire's size. It is always represented by a letter - in the following example the tire speed rating is "W". Once you know your tire speed rating, you can work out what is the maximum speed your tire is capable of maintaining. For example, the "W" rating seen in the image, tells us that this tire can reach speeds of up to 168mph. Speed ratings are based on tests in which engineers run the tire at 6.2 mph steps, in 10 minute increments, until the required speed has been met. 1.Reinforced Tyre Sidewall. Manufacturers that produce these include Continental, Dunlap, Bridges tone, Goodyear, and Pirelli. 2.Rubber clip to your rim. Manufacturers that produce these include Michelin. All Run flat technology must operate in tandem with tyre pressure warning systems. The diagram below shows the Dunlop DSST run flat system. These tires can be placed on any rim - the sidewall is reinforced allowing the tire to support the vehicle's weight. The tire is constructed with new rubber compounds that prevent tire destruction with excessive flexing. Run Flat Tires allow a vehicle with complete loss of tire pressure to handle effectively. Braking, acceleration, and steering behavior remain unchanged. Mobility is also maintained even after a puncture, but you must refer to each individual tire’s guidelines from the Manufacturer. Tires that carry this technology include the Bridgestone RFT series, Continental SSR series Dunlop DSST series, Goodyear ROF series, and the Pirelli Euphori series. The rubber clip prevents the tyre rim cutting into your tyre when you experience a sudden loss of pressure. This system has been developed by Michelin and is known as the PAX System. Like the reinforced sidewall it operates in tandem with automated tyre pressure monitors. Why fill my tires with Nitrogen? Nitrogen has long been the accepted gas medium for filling aircraft tires, racing tires and heavy mining and construction vehicle tires. Nitrogen is used for safety reasons and to ensure that tires are always at a constant pressure. Compressed air, the traditional medium for inflating car tires, contains both oxygen (21%) and nitrogen (78%). The rubber tire is like a membrane, through which oxygen permeates three times faster than the nitrogen. The result is that the oxygen slowly leaks out through the rubber walls, and the under-inflation leads to higher tire wear with a consequent decrease in safety and comfort, and higher fuel costs. The winter season brings many variations in weather type and as a result driving hazards increase considerably. This is statement is backed up by statistics which show that there are nearly 7,000 more accidents involving cars on the UK’s roads in winter than there are in summer. Wet road conditions can be just a dangerous as snow and ice, not least because drivers tend to slow down when it snows but often drive just as fast in the wet. The number of accidents caused by wet road conditions increases nearly threefold in the winter, whilst drivers are five times more likely to skid in snow and ice than in dry road conditions. It therefore pays to make sure that your vehicle is properly prepared for the British winter. Here Black circles.com gives you some handy hints and safety advice to make sure you and your family remain safe on the roads over the winter period. One thing to strongly consider first of all though, is the fitting of winter tires during the winter months. Make sure your car is well maintained – keep it serviced. Check your battery. Keep terminals corrosion free and coated with Vaseline. Check your tire pressures on a regular basis. Incorrectly inflated tires affect vehicle handling, whilst under inflated tire increase fuel consumption. Make sure that your spare tire is also correctly inflated - make sure your tires have plenty of tread depth. In wet and cold conditions tire performance is critical once the tread depth falls below 3mm. The legal tread depth is not necessarily an indication of safety! Check your engine oil level every two weeks and before long journeys. Check the coolant level and make sure you have enough antifreeze. A 50/50 mix of antifreeze to water will protect the engine to a temperature of –34 C.
Regularly top up your screen wash. Check windscreen wipers and replace if they are smearing. Check windows are clean and lights are in good working order. Make sure windows are free of snow and ice. Driving with “portholes” is dangerous and can get you a hefty fine. Keep a tool kit in your car - a jack and wheel removal tools are essential. Consider fitting cold weather/winter tires. The idea that winter tires only give benefits on snow or ice is years out of date as modern rubber compound technology and advances in tread pattern design means the modern day winter tire also provides higher levels of road safety on cold and damp road surfaces too. Cold weather tires give superior grip at temperatures below 7°C which are common in Britain between October and March especially at peak times for travel in the early morning and evening. The compounds used in winter tires contain a higher proportion of natural rubber and coupled with extended use of silica technology they minimize the hardening effect at low temperatures allowing the tire to key into the road surface, resulting in higher grip levels. When combined with the highly siped tread patterns used on winter tires, levels of performance are reached which cannot be matched by summer tires. Avoid traveling in severe weather conditions unless it's an emergency. Carry an emergency kit in the car. Food, a hot drink, a blanket/coat are essential as are equipment such as an ice scraper, DE-icer and a warning triangle. Take a spade if it’s snowing or if snow is likely. Keep your distance. Stopping distances are ten times longer in ice and snow. Use gentle manoeuvres when driving in ice and snow. Use second gear when pulling away to avoid wheel spin and use the car’s controls as gently and progressively as possible. In general use the highest gear possible. To brake on ice or snow without locking your wheels, get into a low gear earlier than normal, allow your speed to fall and use the brake pedal gently. If you start to skid, ease off the accelerator but do not brake suddenly. If you get stuck straighten the steering and clear the snow from the wheels. Put an old rug or something similar in front of the wheels to give the tyres grip. Once moving, don’t stop until on safer ground. Clear snow from roof and windows. Snow on the roof can be a danger both to yourself and other road users. Keep to the main roads wherever possible. Don’t use speeding drivers as a measure of what speed it is possible to drive at. Do not be lulled into a false sense of security. Use dipped headlights and reduce your speed to suit the conditions. In wet weather, stopping distance will be at least double those required on dry roads. Keep well back from the vehicle in front. If the steering becomes unresponsive it means the tyres are not gripping the road (aquaplaning). Ease off the accelerator and slow down gradually. In floods, drive through the flood in first gear without stopping. Once through the water test your brakes. If the water looks too deep, don’t attempt to go through at all. When assessing the depth of water allow for waves caused by vehicles coming the other way. If you do get stuck in snow don’t leave your vehicle unless safety is nearby. Never sit in a sealed car with the engine running – you could asphyxiate yourself with carbon monoxide fumes.